On July 26, The 157th Petaling Flaming Dragon Scout Group had its annual Skills Camp. This year's theme was Galaxias Wars, a fusion between Star Wars and Greek Mythology. Because of this, the patrols which the scouts were grouped in were given special names like Gaiabacca, Zeus Skywalker and Darth Hades. The camp was guided by the troop's scoutmasters consisting of Mr Maverick Teh, Mr Foong Han Sean, Mr Goh Jian-Yong, Mr Cheong Wern Kit, Mr Ivan Gaban, Mr Kwang Yong Tick, Ms Lee Yu Feng with teacher advisor, Encik Mohd Ridwan, helped by the senior scouts. The camp officially kick-started with the flag-breaking ceremony. This activity involved deploying the troop flag, singing the national and state anthem followed by a speech by one or more scoutmasters. Here they gave orders on what the campers needed to do after the ceremony. The scouts then set about doing the tasks given. 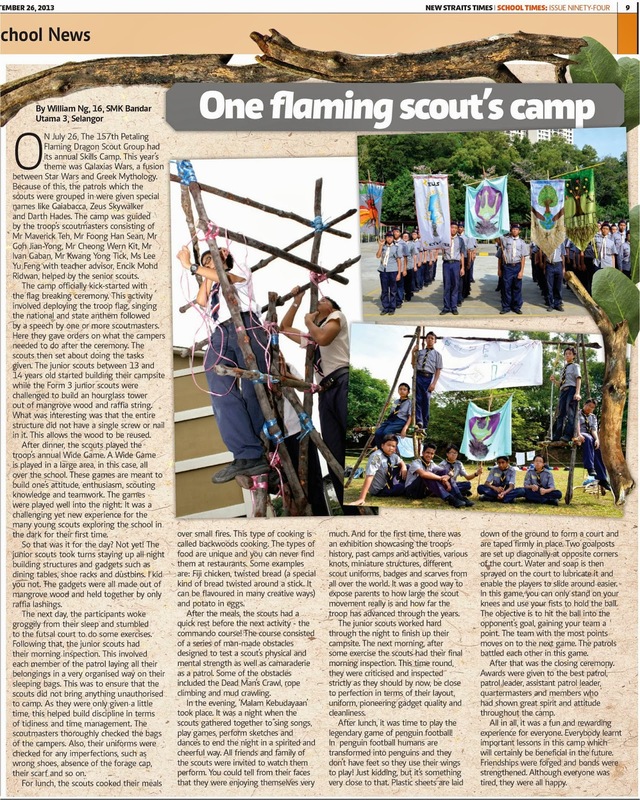 The junior scouts between 13 and 14 years old started building their campsite while the Form 3 junior scouts were challenged to build an hourglass tower out of mangrove wood and raffia string. What was interesting was that the entire structure did not have a single screw or nail in it. This allows the wood to be reused. After dinner, the scouts played the troop's annual Wide Game. A Wide Game is played in a large area, in this case, all over the school. These games are meant to build one's attitude, enthusiasm, scouting knowledge and teamwork. The games were played well into the night. It was a challenging yet new experience for the many young scouts exploring the school in the dark for their first time. So that was it for the day? Not yet! The junior scouts took turns staying up all night building structures and gadgets such as dining tables, shoe racks and dustbins. I kid you not. The gadgets were all made out of mangrove wood and held together by only raffia lashings. The next day, the participants woke groggily from their sleep and stumbled to the futsal court to do some exercises. Following that, the junior scouts had their morning inspection. This involved each member of the patrol laying all their belongings in an organised way on their sleeping bags. This was to ensure that the scouts did not bring anything unauthorised to camp. As they were only given a little time, this helped build discipline in terms of tidiness and time management. The scoutmasters thoroughly checked the bags of the campers. Also, their uniforms were checked for any imperfections, such as wrong shoes, absence of the forage cap, their scarf and so on. For lunch, the scouts cooked their meals over small fires. This type of cooking is called backwoods cooking. The types of food are unique and you can never find them at restaurants. Some examples are: Fiji chicken, twisted bread (a special kind of bread twisted around a stick. It can be flavoured in many creative ways) and potato in eggs. After the meals, the scouts had a quick rest before the next activity - the commando course! The course consisted of a series of man-made obstacles designed to test a scout's physical and mental strength as well as camaraderie as a patrol. Some of the obstacles included the Dead Man's Crawl, rope climbing and mud crawling. In the evening, ‘Malam Kebudayaan' took place. It was a night when the scouts gathered together to sing songs, play games, perform sketches and dances to end the night in a spirited and cheerful way. All friends and family of the scouts were invited to watch them perform. You could tell from their faces that they were enjoying themselves very much. And for the first time, there was an exhibition showcasing the troop's history, past camps and activities, various knots, miniature structures, different scout uniforms, badges and scarves from all over the world. It was a good way-to expose parents to how large the scout movement really is and how far the troop has advanced through the years. The junior scouts worked hard through the night to finish up their campsite. The next morning, after some exercise the scouts had their final morning inspection. This time round, they were criticised and inspected strictly as they should by now, be close to perfection in terms of their layout, uniform, pioneering gadget quality and cleanliness. After lunch, it was time to play the legendary game of penguin football! In penguin football humans are transformed into penguins and they don't have feet so they use their wings to play! Just kidding, but it's something very close to that. Plastic sheets are laid down of the ground to form a court and are taped firmly in place. Two goalposts are set up diagonally at opposite corners of the court. Water and soap is then sprayed on the court to lubricate it and enable the players to slide around easier. In this game, you can only stand on your knees and use your fists to hold the ball. The objective is to hit the ball into the opponent's goal, gaining your team a point. The team with the most points moves on to the next game. The patrols battled each other in this game. After that was the closing ceremony. Awards were given to the best patrol, patrol leader, assistant patrol leader, quartermasters and members who had shown great spirit and attitude throughout the camp. All in all, it was a fun and rewarding experience for everyone. Everybody learnt important lessons in this camp which will certainly be beneficial in the future. Friendships were forged and bonds were strengthened. Although everyone was tired, they were all happy.